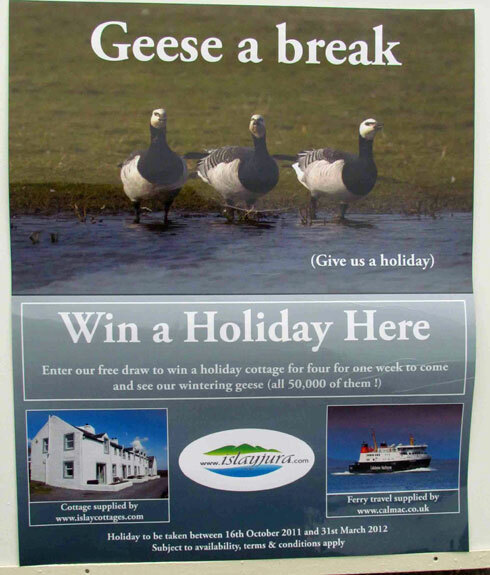 Under the motto ‘Geese a break’ (a play on ‘Geesa break’, which can be translated as ‘Give us a holiday’) six people from Islay will travel to Rutland to promote Islay as a place to visit. They include members of the Islay and Jura Marketing Group, the Islay Natural History Trust and the RSPB on Islay (with some generous help by Calmac and all the Islay distilleries). They will of course talk about the birdwatching and wildlife on Islay, but also other activities like the walking week (which often includes a bit of birdwatching by default). And for those who would like a wee taste of Islay there will also be the odd wee dram of Islay single malt whisky, I'm told. Ian, Carl, George, Megan, Michal and Andy hope to see you there!